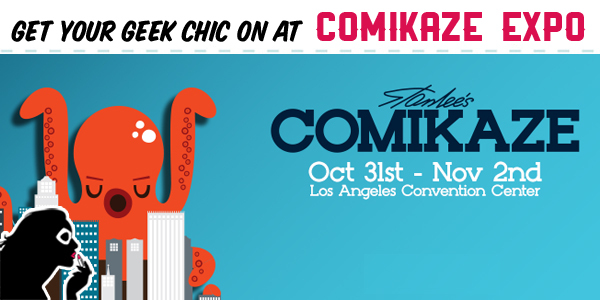 Get Your Geek Chic On At Comikaze Expo! If you’re even remotely interested in geek fashion, then you definitely wont want to miss the fourth annual Comikaze Expo this Halloween weekend at the Los Angeles Convention Center! From numerous geek fashion related panels, to the aptly named Geek Fashion Show on Friday, there are loads of events and vendors you’ll definitely want to check out. If you were near the convention center in LA this weekend, you may have noticed a large comic convention taking place, Stan Lee’s Comikaze Expo. Despite the long lines and extreme heat, we did manage to spy some great geek chic outfits and merchandise around the exhibit hall.